Experts find it difficult to draw a precise line between pansies and violas, and the relationship has become blurred over time, although the year 1810 was significant in the development of the pansy. This was when it took the fancy of a Mr T. Tomson, head gardener to Lord Gambier, a retired admiral with a passion for gardening. The gardener developed the pansy by crossing and re-crossing varieties of viola tricolour (heartsease) with the yellow viola lutea and viola altaica. The flowers he introduced lost their long viola faces, and became rounder and more richly coloured. By the middle of the 19th century hundreds of new pansies were on the market, and today’s modern hybridists continue to create a mixture of opulent and enchanting varieties. 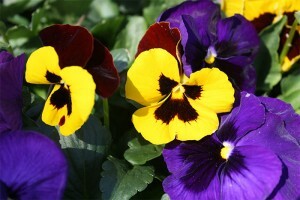 Pansies are perfect bedding plants, but they don’t always have to be tucked primly here and there under larger plants. They make a cheery carpet for tall bulbs, or planted in drifts of one colour to make a bold statement — maybe a sea of celestial blue, such as the old-fashioned ‘Maggie Mott,’ rusty brown or chocolate like the miniature, yellow-whiskered, ‘Velour Frosted Chocolate’ or maybe dramatic black – ‘Bowles Black’ self-seeds freely so you’ll never run out of plants! When annuals have done their dash and perennials hibernate, the pansy blooms merrily on — it’s easy to have pansies flowering in your garden for most of the year. Plant out pansies in full sun in well-drained soil, although if you’re planting in the summer months choose a semi-shaded spot rather than full sun, and opt for the large-flowered varieties — pansies tend to produce smaller flowers in hot weather. I think pansies are at their best in autumn, winter and early spring — the cool weather keeps the foliage compact so the buds and flowers can rise above it, and they are much less likely to suffer from mildew. In cold weather the petals of all pansies are thicker and more velvety, and there is generally no problem with aphids — ruffled pansies, such as ‘Frizzle Sizzle,’ which is bred for earliness and uniformity, must have cold weather too, for the ruffles to develop properly. So whether you see a cat’s face, a butterfly or simply a sumptuous combination of colours when you gaze into their pretty faces, there’s no doubt that these cold weather plants consistently light up our dull, winter days.